Since coming into my possession, this rarity has been one of my favorites by far. 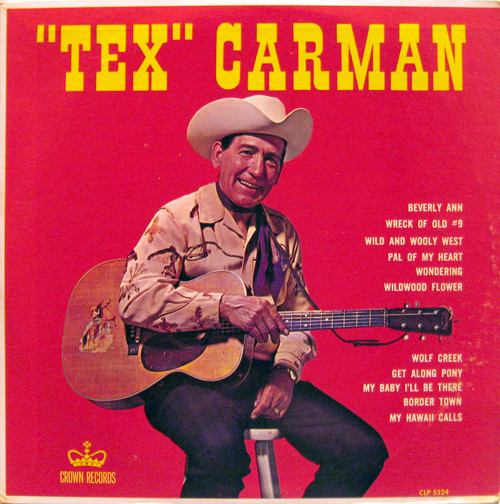 This forgotten hillbilly singer of the 40′s and 50′s has one of the most authentic falsetto country drawls I’ve ever heard, and combined with a unique guitar style, Tex stands out in the collection of “unknown cowboys.” Although he was criticized for being a drunkard who lacked rhythm, he still managed to put on an impressive performance, and in my opinion, he had it all, including rhythm – it was simply to his own drum. Speaking 40 years later, Capitol Records producer Ken Nelson still winced at the memory of recording him: ‘He was so lacking in rhythm but he had this goofy sound on the guitar and he sold records. He was always liked by his fellow artists although most commented on his vocals and guitar playing. Wesley Tuttle rated him the worst musician in the world but paid tribute to his stage presence. Carman died at the age of 64; there is little doubt that he is indeed a character who deserves to be remembered. 14 May 1903, Hardinsburg, Breckinridge County, Kentucky, USA, d. 2 February 1968. The TEX Carman story is a bio pic I’d love to see. Thanks for sharing, great as always!